We are proud of our team because each member is special! 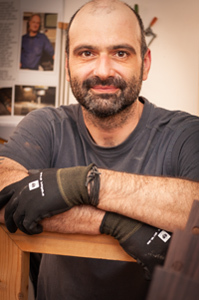 Markus started at Lakewood in October 2000 after his apprenticeship in the UK, first in the paint shop and then in the set-up section. Since 2003 he has been responsible for the Lakewood web site and has played an ever increasing role in the creative sector. In 2006 he made a change and took over the marketing and sales functions. Since then he has been responsible for relationships with dealers, wholesalers and musicians as well as public relations, web site and graphic design. 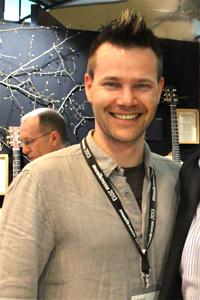 He has been a shareholder in the company since 2010. Herta is responsible for good vibes in the office! That is in addition to the other hard work she does such as wage administration, taxation, insurance issues – which would be enough to put anyone in a bad mood... but not Herta. This cannot be over-valued! She has a kind word for everyone and even presents the products of her baking skills at the daily breakfast. As you might imagine, the shelf life of one of her cakes in the office is very short! Manja is our latest fluke and reinforcement in the office. 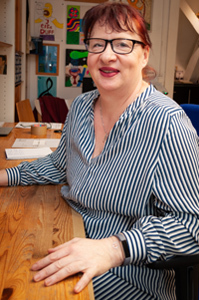 Since Herta has a lot of work with baking her cakes, Manja gives some relief in terms of invoicing, shipping the guitars and customer service via email and telephone. 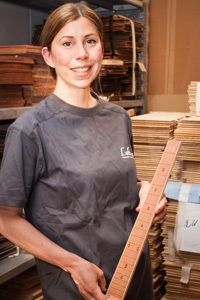 She knows very well about guitar shipments to far away countries, the odds of exporting business and everything you have to take care of when sending guitars abroad. We cannot go without her qualities anymore! 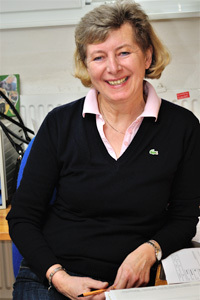 Jan has been the representative towards our dealership since March 2019. But he's everything but just another rep! As a full member of the Lakewood Team he is attached to the company by all means. He had a tough checkup to go through with his Lakewood mates before we let him go on the road to visit our dealership in the outside world. Jan will be supervising the retailers in Germany, Austria and the Benelux countries in the best-possible manner and be available with his advice and help. He sure has a couple of guitars with him on each trip he is doing. 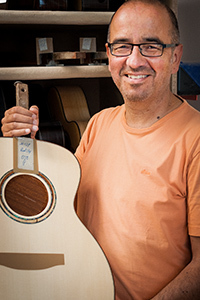 Andi is a luthier who has been with Lakewood from the very start. Anyone wondering how things were at Lakewood in the eighties will be rewarded with many wonderful anecdotes from him. Andi handles raw material purchases and supplier contact – a vital role. Quietly he sees to decency and tradition in this rather young team. 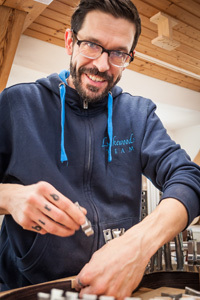 In the production he handles the planing and finishing of strips for bindings and purflings and is responsible for all binding inlays and decoration. Moritz is another longstanding Lakewood employee. Much of the firm’s know-how resides in the mind of this master-luthier and without him we would not be where we are today in many respects! 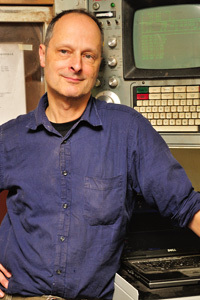 He is the mastermind behind creation of jigs, the preparation of CAD drawings and 3D computer designs right through to operation of the CNC machines. Circumspection, farsightedness and critical evaluation are his most important attributes. Above all he is a humorous guy and for everybody in the team a VIP. 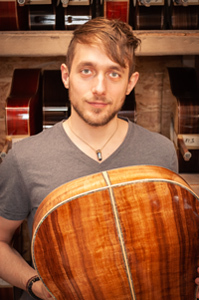 Henrik is a guitar enthusiast with heart and soul. A part of the firm for the past 10 years, he has enriched the Lakewood team. 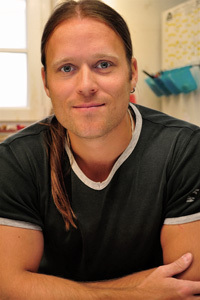 In the production Henrik is the "Lord of the timbers", because he takes care of all material deliveries from the very beginning and ensures that everything goes in the right place in the storage shelves. He also arranges conditioning of the woods, drying and preparation for subsequent working processes. 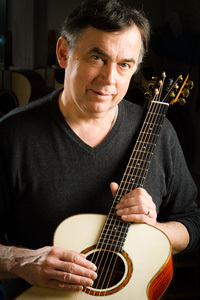 He chooses the timbers for each body by estimating colors and structures to get a perfect wood choice for each single guitar. Jacob has been with the team for many years now. 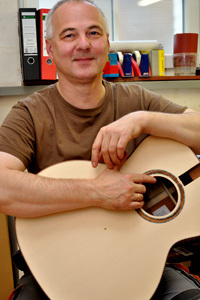 He came to us as fully trained luthier from Klingental to Giessen and gathered lots of experience with us. 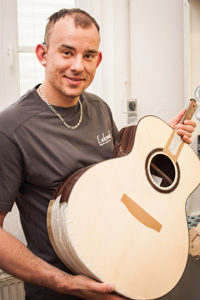 Now he has been a master luthier for a long time (the youngest master we ever had!) and recently took over the workshop management. He supervises his colleagues and is the contact person if there's questions with daily work. If there should ever be a lack of manpower he can jump in and make sure the work flow is safe. Knut has taken over the body making department for quite a while now. The perfect job for him, because he lets all his positive energy stream into each single guitar. Serenity, consideration and balance are properties that can only be achieved after intensive years in the Giessen punk music scene. His broad knowledge in music and styles is the time witness of this lively period. Knut is also the main cookie supplier on the breakfast table of the Lakewood Team. Thank you mate! 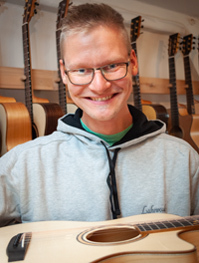 Hannes has been ready qualified luthier since 2015 now. And as you can recognize by the name - he's Martin Seeliger's son. After a time of work-experience in the United States he is back with us. With a broad sight and lots of enthusiasm Hannes is the wingman of René in the setup department. 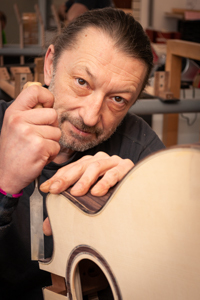 He prepares necks, makes nuts, polishes frets and mounts tuners. Furthermore, he polishes all high-gloss guitars on the buffing wheel. His easy going and humorous personality is very important for the team. Thomas has been our man in the lacquering departement since January 2016. He has taken the challenge of these difficult and exhausting procedures and now takes care of the perfect finish of each instrument. His accuracy and his sense of order are two main attributes that distinguish him. We are very happy to have him as part of our team. The outer optical appearance of a guitar depends on the finish a great deal. Thomas has just the right feeling to do it perfectly. Lea is in charge of all the delicate jobs here at Lakewood. Since 2016 she has been doing all adornments, like i.e. the Lakewood logo inlays in the headstock veneer and the soundhole rosettes. She takes care of all different kinds of fingerboard inlays, because we do many different graphics besides "just" snowflakes and dot inlays. Everything is embedded in wood by her with great care. Lea's way of working is distinguished by her diligence and thoughtful accuracy. So the fine inlay work is in her best hands! 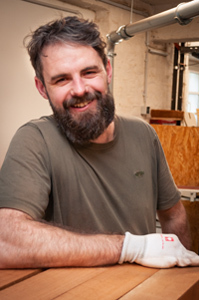 Together with Jacob and Friedemann, Philipp ensures good bodies and necks each week. Half of his time he takes care of fretting and sanding necks and also makes body bindings, body sanding and neck fitting. 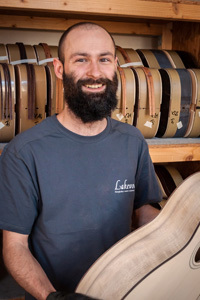 The other half of his time he is making our classical Khaya nylon string guitars. He's fretting the necks and prepares them for the lacquering department. Also the guitar bodies get their bindings and final sanding from his hands. Without his OK nothing is going to the lacquering department. Angelo has a very interesting past in terms of his former profession as he used to be the agent of a big record label here in Germany. As A&R he has been touring with various known and unknown artists though Germany, Switzerland and Austria. We are very happy to have him here in charge for all the guitar necks. He takes very good care of this responsible job with great dedication day by day. James has been reinforcing the team for a couple of years now in the pre-production. He's got a very interesting background as a boat builder and is if you like a career jumper. Since summer 2018 Vadim has been a steady part of the Lakewood Team. 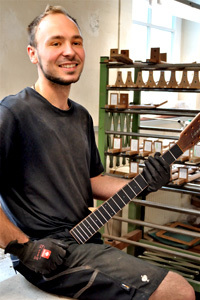 Together with Guido he is in charge of all binding decoration of the guitars. 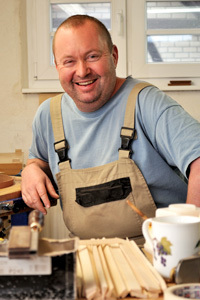 The careful fitting and gluing of the bindings is one of his central tasks, which he manages with great commitment. All joints and mitrecuts are being executed by him with lots of attentions to detail - a fine working step that a CNC couldn't do. Guido takes care of all body decoration work together with Vadim. This delicate work - sometimes just with fine wood bindings, sometimes with elaborate abalone purflings - is performed by Guido with a high level of own aspiration. This takes every single guitar to a high profile perception. The body sanding work that follows this step lies also in his hands; a job that is crucial in terms of look and feel of all guitars. We are happy to have him in our team!